Here you can find birthday trains! 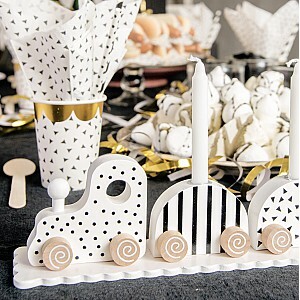 A birthday train is a festive detail on the table at the birthday party and is also a nice gift. It is a lovely and appreciated tradition to decorate with the train at every birthday party or celebration. We have trains with wagons with light holders and interchangeable numbers that show how many years the birthday child becomes. The train is a nice birthday candle. A wonderful table decoration on the birthday and at birthday parties! Black / White. 63 x 7 x 6 cm.